Assistant Director of Alumni Relations Caitlin Halloran, left, Wynter Lastarria ’15, and Hannah Armbruster ’15 encourage community members to contribute during the day of giving, May 1. No one knew quite what to expect on May 1, the first day of giving in the College’s 150-year history. 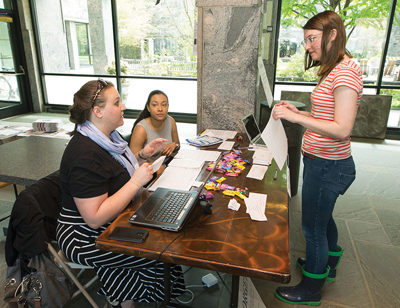 The effort was dubbed “Spring for Swarthmore,” and, when all was said and done, more than 2,400 people did just that, nearly tripling the goal for the day of 864 donors. Almost 400 first-time donors contributed to the more than $1.4 million total raised, much of it earmarked for student financial aid. Donors were motivated in part by a $1 million challenge from a matchbox couple. Alumni Council members David Jenemann ’93 and Mark Shapiro ’88 spearheaded the effort, partly as a way to celebrate the College’s sesquicentennial. Dozens of volunteers—including Alumni and Parents Council members, Managers, and class volunteers—spread the word via email and social media. “The support of the Swarthmore community only underscores the tightness of our community and the desire of our alumni base to remain active, enthusiastic participants in the College,” says Shapiro.